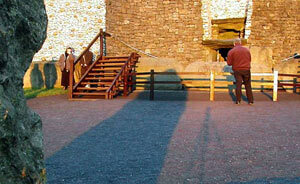 Above the entrance to the passage at Newgrange there is an opening called a roof-box. Its purpose is to allow sunlight to penetrate the passage and chamber at sunrise around the Winter Solstice. At 8:58am a narrow beam of light penetrates the roof-box and reaches the floor of the chamber, gradually extending to the rear of the passage. As the sun rises higher, the beam widens within the chamber so that the whole room becomes dramatically illuminated. After 17 minutes the sunbeam leaves the chamber and retreats back down the passage. All are welcome to gather at Newgrange for the sunrise on the mornings around the Solstice (December 18th to December 23rd). Access to the chamber on the Solstice mornings is decided by lottery. The draw for Solstice 2010 will take place on September 24th 2010. The successful people will be notified by mid October. Fifty names are drawn, and each of the lucky winners can bring a guest, there are ten lottery winners and their guests in the chamber on each of the mornings around the Winter Solstice. 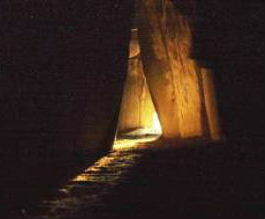 When Newgrange was built over 5000 years ago, the winter solstice sunbeam would have made its way to the back recess of the central chamber. Due to changes in the tilt of the Earth's axis the sunbeam now stops 2 metres from the back recess. Images from the morning of the 21st December 2006. Joe & Clare won tickets in the winter solstice lottery for December 22nd, they were very fortunate to experience a glorious sunrise in the chamber at Newgrange. I am very grateful to Anne-Maria Moroney who was at Newgrange on the 20th of December and has made these images available. The sun didn't shine on the morning of the 21st December, the disappointment was eloquently described by Eileen Battersby in the Irish Times. Images from the actual morning of the winter solstice - 21st December 2004. This image photographed from inside the chamber by Alan Betson was printed in the Irish Times newspaper on the 22nd December 2004. 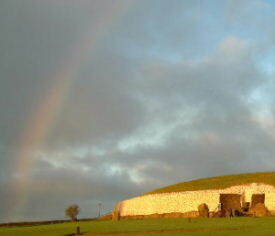 Beautiful sunrise at Newgrange on the 19th December 2004. 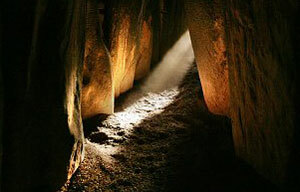 Sun light in the passage at Newgrange viewed from the entrance. 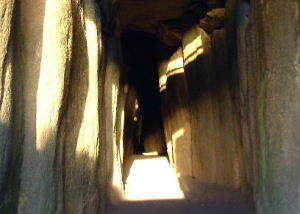 The Winter Solstice sunrise illuminates the passage way leading into the burial chamber of the megalithic passage tomb at Newgrange on the 21st December 2003. This wonderful photograph by Alan Betson was printed on the front page of The Irish Times newspaper on the 22nd December 2003. 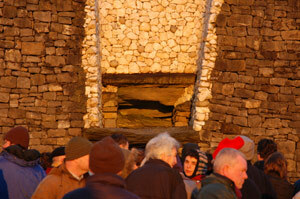 Images from the Winter Solstice at Newgrange on the 22nd December 2002. A rainbow heightened the experience of those on the outside, as the fortunate few on the inside, selected by lottery experienced the illumination of the passage and chamber. Solstice sunrise lets lucky few gaze through window to an ancient world. 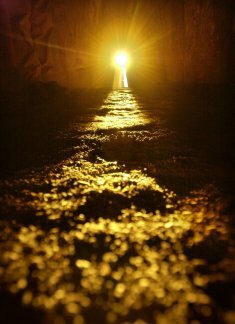 Light at the end of the tunnel: the sun makes its way into the main chamber at Newgrange during the winter solstice, photography by Frank McGrath. photographs which are now available to purchase.